Brian Glyn Williams is professor of Islamic history at the University of Massachusetts -- Dartmouth, where he teaches a course on the history of Chechnya. A Chechen man picks up a loaf of bread in Grozny in 1995. Credit: Wiki Commons. In the aftermath of the killing and arrest of the Tsarnaev brothers, responsible for the Boston marathon bombings, the worst terrorist attack on American soil since 9/11, there has been much speculation and interest in their ethnic origins. The media was quick to report that the brothers had Chechen ancestry, but few Americans know what that means. Having taught what is perhaps the only class in America, if not the world, on this obscure land for nine years at University of Massachusetts -- Dartmouth, I thought I would take advantage of this unique moment to shed some light on the brothers’ little known homeland and its ancient people. The Chechens are an ancient highlander people who have lived in the high peaks of the northeastern Caucasus Mountains since time immemorial. They were there before the modern Indo-European (Aryan) races such as the Germans, Italians, Greeks, Celt and Slavs came to the region, and their complex language known as Vainakh is not related to these European languages. The Chechens converted to a watered down, mystical form of Islam known as Sufism in the 16th century, but were never strict fundamentalists of the sort one found in Saudi Arabia. In the 1800s the expansionist Russian empire began to encroach into their lands and the Chechen highland clans fought back ferociously. As the Russians burnt their villages and ethnically cleansed the lowlands the Chechens waged a desperate battle to maintain their ancient freedom. At the time Russian authors such as Lermontov and Tolstoy wrote admiringly of the Chechen mountain warriors’ courage. But for all their bravery the Chechens could not resist the might of the transcontinental Russian Empire, the largest state in the world. In 1861 the Chechens finally submitted to Russian rule and became sullen subjects of the Tsars of Orthodox Christian Russia. In 1917 the tsar was overthrown and the communist Soviet Union was subsequently formed. While the oppressed Chechens hoped that their condition would improve they were to find the Soviets even harder masters. The Soviet secret police and the Red Army cracked down on the Chechens’ folk Islam, killed their leaders, banned festivals and confiscated their lands, all in the aim of wiping out their ancient culture. Then, in 1944, during the final days of World War II, disaster struck. Soviet dictator Josef Stalin ordered the entire Chechen race deported to the depths of Siberia and Soviet Central Asia, to exile in Uzbekistan and Kazakhstan. More than one in three Chechens died as they were dragged onto freight trains from their burning villages and scattered across the frozen wastes. A whole nation had been sentenced to destruction in what could only be called an act of genocide. But the Chechens reacted by having many children to replenish their nation and by keeping their traditions and language alive in exile. In the mid- and late 1950s the Chechens surged back to their beloved Caucasus Mountains after Stalin died and resettled in their homeland. During their absence many Russians had been settled in their homes and villages and their towns had been given Russian names. Ancient Chechen graveyards and mosques were destroyed as well. Once back in Chechnya the Chechens lived as a distrusted minority under a state that had tried to wipe them out as a people. When the multiethnic Soviet Union (i.e. a union of 15 Soviet "union republics") disintegrated in 1991, the Chechens sought freedom from the rump state of Russia. But while the post-Soviet Russians were willing to accept the loss of the fourteen other Soviet union republics (for example, Ukraine, Armenia, Kazakhstan etc.) they were not willing to let the Connecticut-sized Chechnya breakaway from Russia proper. When the Chechen president Djohar Dudayev (for whom the Boston terrorist Dzhokhar Tsarnaev was most likely named) declared independence in 1994, the Russians launched a full-scale invasion to crush the breakaway republic. But in a remarkable David versus Goliath war the outnumbered Chechen boyeviks (warriors) beat the better armed, larger Russian army. The Chechens gained a reputation as perhaps the world’s fiercest fighters at this time. From 1996 to 1999 Chechnya was for all intents and purposes independent but was the subject of crippling economic sanctions from surrounding Russia, which seriously weakened the fledgling state. 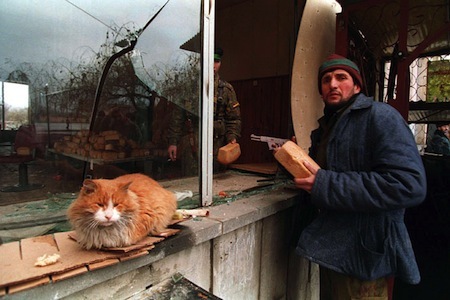 In 1999 the new Russian president, Vladimir Putin, re-invaded the breakaway republic, this time with a much larger army, after a Chechen raid into Russia. On this occasion the Russians burnt any village that resisted, arrested all military-age males in rebellious districts, created vast prison camps, cleansed whole provinces in what were known as zachistkas (cleansings) and tactically obliterated the Chechen capital Grozny, which had been renamed Djohar in honor of the recently slain president Djohar Dudayev. As the world watched on in dismay, Grozny was flattened as completely as Hiroshima by Russian artillery, bombs, and Scud missiles. Thousands of innocents died in the destruction. You could actually see Chechen villages and Grozny burning from satellite images of the time. One-third of the Chechens fled their homeland due to the Second Chechen War, and one-fifth of Chechyna's population (200,000 people) was killed. Facing extermination and state-sponsored terrorism most Chechens surrendered, but some rebels fled to the southern hills to wage a desperate guerilla war/jihad. From the forested mountains small bands of fighters harass the Russians still to this day, though Moscow has essentially won the war. Some of the rebels have engaged in acts of terrorism against Russia, such as the Nord Ost theater siege in Moscow in 2002 or the Beslan school hostage crisis in 2004. In both these cases the Russians stormed the hostage takers, killing both them and their hostages. There were also Chechen women suicide bombers known as the ‘black widows’ whose husbands had been killed by the Russians. One must not, however, make the mistake of confusing the Chechen jihad rebels or terrorists with al Qaeda, and the Chechens have never defined America as an enemy. Most emulate America for breaking free from Britain. No Chechens were ever found in Afghanistan or Iraq, none were sent to Gitmo, and their leaders have condemned both 9/11 and the Boston Marathon bombing. This is the tragic history of Chechnya and the Chechens. While it is only speculation, one can theorize that such a violent history -- defined by total war, repression and terrorism -- may have impacted the Tsarnaev brothers’ view of the world and their subsequent actions. The older brother was said to have made a recent trip to the region. While it does not excuse their acts of inexplicable evil, this history might help put them in context and explain (literally) where they are coming from. For articles on Chechen history and their insurgency/terrorism see my publications here.